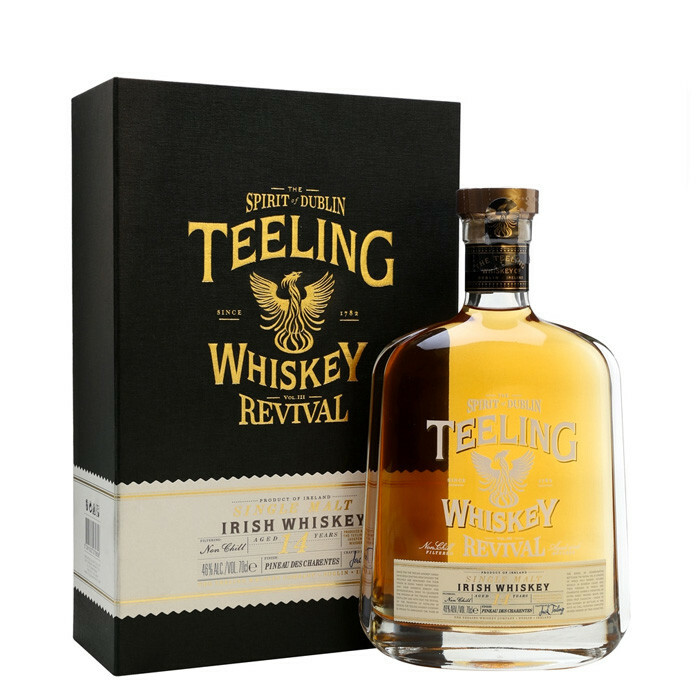 Consists of 14 Year Old Single Malt Irish whiskey distilled in 2002 initially matured in Bourbon barrels for the first 13 Years before it was given an extra years maturation in ex-Pineau Des Charentes casks. Bottled at 46% with no chill filtration creates a truly unique Irish whiskey taste experience. The third limited edition bottling in The Revival Commemorative Series. Limited to 10,000 decanter bottles with premium secondary packaging to ensure on-shelf stand out. Nose: Subtle bouquet of honey and hazelnuts with rich dark chocolate undertones. Taste: Dried fruit and toffied pineapple giving way to toasted almonds and dark chocolate. Finish: Balanced, rich mouth feel with a lingering soft sweetness. Subtle bouquet of honey and hazelnuts with rich dark chocolate undertones. Balanced, rich mouth feel with a lingering soft sweetness.